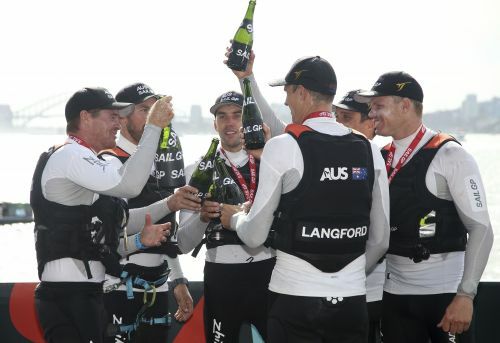 SYDNEY (AP) — Tom Slingsby and his Australia high-speed catamaran won the opening Sydney SailGP event, finishing first in four of the five fleet races and then winning the championship match race over Japan on Saturday. Starting the second day a point behind the Japan boat skippered by Slingsby's fellow 2012 Olympic gold medalist Nathan Outteridge, Australia won Saturday's two fleet races. The two boats were neck and neck in the early stages of the head-to-head final, but Australia pulled away to win by 37 seconds. "It felt like he (Outteridge) was always there, he was always one mistake away and he was sitting there lurking. If we made that mistake, he would have pounced," Slingsby said. "We learned from yesterday and we improved more than I could have even hoped we would. I couldn't be happier with how today went. I hold our team to a very high standard and they over-delivered, it was unbelievable." The wind was mainly in the eight to 12 knot range for both days, not allowing the high-powered boats to get anywhere near their top speeds. The pre-event suggestions that the Slingsby and Outteridge boats were favorites proved true, as none of the other four competitors managed a win. "We don't need more of a rivalry than what we already have,'" Outteridge said. "Everyone was kind of expecting the two of us in that match race. We didn't quite get over them at the start. They were on form all day sailing really well and we missed a few little things here and there." After the first of five events, Australia leads the standings with 48 points. Japan has 45. Britain, with skipper Dylan Fletcher, has 36, followed by China (skipper Phil Robertson) and France (Billy Besson) with 33 points each, and the United States, skippered by Rome Kirby, with 31. SailGP is the sailing league founded by tech billionaire Larry Ellison and five-time America's Cup winner Russell Coutts. It features many of the world's top sailors racing 50-foot, wing-sailed catamarans that fly across the top of waves on hydrofoils. Unlike in the America's Cup, all the boats are identical. Crews won't be allowed to make changes without approval of the measurement team. The six teams will compete at five tour stops, with the finale being a winner-take-all, $1 million match race between the top two teams to crown the 2019 champion. The tour next stops in San Francisco on May 4-5; New York on June 21-22; Cowes, England, on Aug. 10-11; and Marseille, France, on Sept. 20-22 for the final that will include the $1 million race.